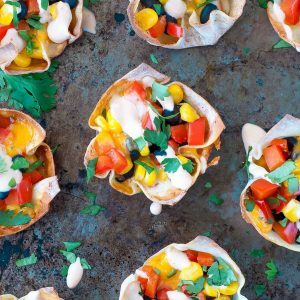 Quick, easy, and uber customizable, these Southwest Veggie Won-ton Cups are ready to take your snack game to the next level! Serve them up as a side dish, appetizer, or snack, or add your favorite protein and give them spotlight status at mealtime. Prep a muffin tin with mini or standard sized cups by spritzing with oil. In a bowl, combine bell pepper, corn, black beans, and cheese. Set aside. Next lay out your won-ton wrappers on a cutting board and season each side with paprika and garlic powder. Mold each won-ton square to the cups in the muffin tin and fill with your veggies and cheese. Bake at 350 for 10-14 minutes or until the won-ton cups are crispy and golden and the cheese has melted. For extra crispy cups, bake the won-tons first at 350 for 8-10 minutes, fill shells with veggies and cheese, then bake for an additional 10 minutes. While you wait on the oven, whisk together your sauce and chop your cilantro. Garnish each completed veggie cup with a dizzle of sauce and a sprinkle of cilantro. Dig in! I used a blend of mozzarella and cheddar cheese but feel free to use any of your favorites! Pepper Jack cheese would taste great and so would Gouda! Have fun with it!For a speedy no-chop no-blend sauce I simply used the adobo sauce from the canned chipotle peppers to season my yogurt sauce with. If you want to dice or blend the peppers into this tasty condiment, go for it! I'll often blend a big batch and put in on everything from quesadillas to french fries. It's cool, creamy, smoky, and beyond delicious! Enjoy! For a freezer-friendly snack, under-bake the won-ton cups by a few minutes an freeze, spaced on a baking sheet. Transfer to a freezer safe container and simply pop them in the oven or toaster-oven for a speedy snack or uber-easy appetizer! Feeling saucy? Double or triple the sauce recipe and put it on everything!